Here you can find online guidance and help to the different aspects of job searching. 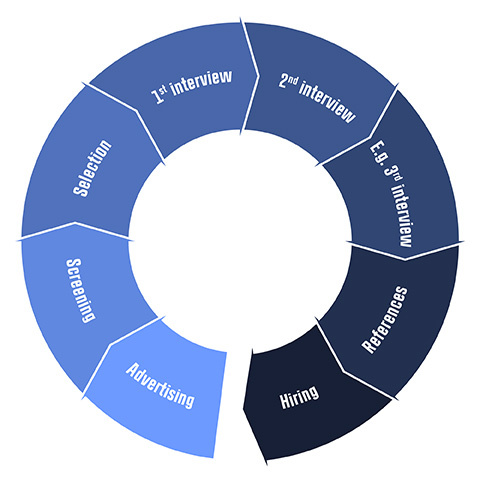 It takes time to prepare an efficient CV. It is an on-going process and your CV has to evolve in line with your studies. It is worthwhile to put extra effort into preparing your CV, as an efficient CV will optimise your chances of landing an invitation to a job interview. There is no 'one size fits all' solution to constructing the perfect CV, but that does not mean that anything goes. Get off to a good start by using CBS Careers' templates, but keep in mind to find your own style and let your CV reflect who you are. The hardest part of making a CV is often describing your job assignments. It matters how you formulate your CV. Use action verbs when and where they are needed, but do not overuse them. Find inspiration for action verbs (pdf). Always make sure to check the layout and the formulations before you send it. Check the spelling and grammar. You can also drop by CBS Careers' open guidance, every Monday-Friday from 09.30-13.30 and get feedback from one of the career counsellors. The purpose of the cover letter is to explain your motivation and qualifications and how they match the job, you are applying for. The cover letter should complement your CV and is how you sell yourself to the company. • Must in principle be max. 1 page. You must focus on the two following issues: write a catchy motivation and explain why you are qualified for the position. In other words – target your cover letter. 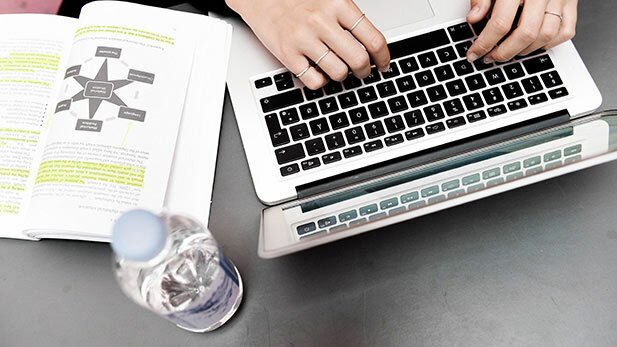 How to get the right message across with a cover letter is up to the individual, but you can use CBS Careers' templates and examples as inspiration. Always make sure to check the layout and the formulations before you send it. Check the spelling and grammar. You can also drop by CBS Careers' open guidance, every Monday-Friday from 09:30 - 13:30 and get feedback from one of the career counsellors. Good news! You have been invited to an interview. Now you need to start preparing. It is common to underestimate the preparation part for an interview but most often it is time well spent to show up prepared. 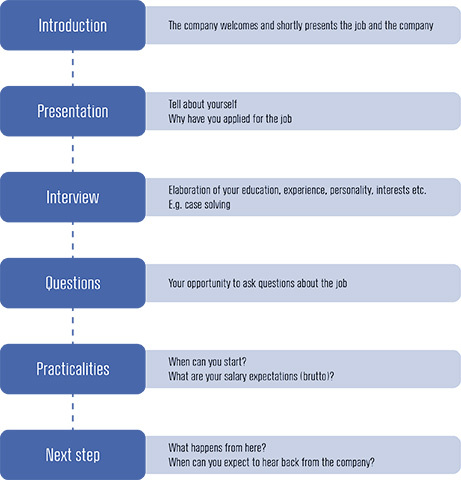 Company recruitment processes vary but below you can see the course of a typical recruitment process for a graduate position. A job interview normally takes 30-60 minutes, with most of the time being spent on getting to know you as a person and your CV. An interview often follows the structure illustrated below, so it is a good indication of what to prepare for. Practice makes perfect - also in job interviews. Whether you get offered the job depends on how you perform, so be prepared! Below is a list to guide you in your preparation. • Practise your answers → this is important! Psychometric testing is a structured collection of knowledge about a person’s capabilities, behaviour, and preferences. Most large companies use psychometric tests as part of their recruitment process and the most common are personality and ability tests. You will typically be introduced to tests in the second interview round. Before you take a personality or ability test it is good to have some basic knowledge about the different types of tests, what you can expect, and if and how you can prepare. Personality tests come in many different forms from a range of test providers. You cannot prepare for a personality test as there are no correct or incorrect answers in these types of tests. When you take a personality test it is important that you do not overthink your answers or freak out about giving contradictory answers. You will get the most rightful picture by following the test instructions and answer the questions swift and honestly. Ability tests are used to test a specific ability e.g. numeracy and verbal skills. The tests are usually timed and you will be under a tight time schedule to finish all the questions. It is important to prepare for this type of test and it is particularly recommended to practise for the numerical parts where most students are weakest. Studies show that you can improve your test score if you practise for ability tests. Do not expect a tiger leap, as your performance is related to your IQ. However with proper practice you should be able to improve from average to above average, which is the acceptable minimum for most employers. What are you good at? What gives you energy? How do you convince a potential employer that you are a good fit for the company? Being aware of your skills is crucial if you want to get off to a positive start in your search for a job. If you give a vague presentation of your skills, they may also seem vague to a potential employer. As the job hunting graduate, you must convince the employer of how you create value for the company. So before you begin your job search, we recommend that you map your skills. This exercise will give you an indication of where to focus your job search and what to emphasise when presenting yourself to an employer. Knowing what you are able to and what you are good at will also boost your self-confidence. ACADEMIC SKILLS: WHAT DO YOU BRING FROM YOUR STUDIES? As a university student you have many years of schooling under your belt. Through your education, you have acquired a number of general skills. You bring these skills with you, whether you are good at them or not. Depending on your studies, you will also have obtained specific professional skills, for instance valuation, market analysis, etc. A company hires academics because of the skills that students and recent graduates bring. So you already bring the qualifications that are required by an employer. Below is a list of general academic skills for you to get inspired from, in case you are uncertain about what skills you have acquired through your studies. The list is not exhaustive so use it as an inspiration. You should also add your own specific examples. PROFESSIONAL SKILLS: WHICH SKILLS DO YOU BRING FROM JOBS, VOLUNTEER WORK, ETC.? Besides the professional skills you have built through your education, other experience has also given you professional skills. In the effort of identifying these, think about the tasks you have carried out. What did it take to solve them? With which tasks have you been particularly successful? In this way, you will discover your main academic strengths, which is exactly what you need in your job search. PERSONALITY TRAITS: WHAT ARE YOUR PERSONAL QUALITIES? In terms of skills and competences it is also relevant to find your personal qualities. We all possess a personality with some characteristics being more prominent than others. In a professional context, your personality is expressed through the way you work. It is therefore important that you are aware of your personal competences, as an employer is going to place emphasis on the right personal qualities for the job in question. For instance, a team-oriented and service-minded person will not thrive in the long run with filing cases, alone in the basement, as he or she will need human contact. You will most often recognise your preferences as your largest strengths. When you apply for a job, you have to focus on your strengths in particular, but it is also important to the employer that you are aware of your development areas. When talking about skills, it is difficult not to talk about competences, as we often tend to use the concepts interchangeably - especially in Danish. But what is the difference between skills and competences? Skills are an expression of what you are able to, whereas competences are about your ability to translate your knowledge and skills into practice. When searching for jobs, an employer would typically ask you to give an account of your competences, so when you have mapped your skills, the next step is to translate your knowledge and skills to actual competences. Having a skill means what a person can do or accomplish. A skill can be both practical, cognitive, creative, or communicative. Competence is about responsibility and autonomy and is the ability to apply knowledge and skills in a work situation or in a study-related context. In terms of networking and career, LinkedIn has become popular in the business community. LinkedIn is a professional network. You can search for jobs, establish relations, participate in and create professional groups. Don't forget that your profile is your professional business card. On LinkedIn you can share your knowledge and systematise your continuously expanding network. Job search reaches a whole other dimension with LinkedIn, and it is a perfect tool for your exposure. For recruitment consultants and head hunters, LinkedIn is one of the most important tools when searching for qualified candidates. It is a commonly used platform for job search and recruitment, which is why you as a recent graduate should have a LinkedIn profile. Here are 10 tips on how to build a top-level profile on LinkedIn. Make sure that your profile is as complete as possible in terms of education and professional experience. Make short descriptions of your tasks and achievements. Substantiate the information with videos, links to your homepage, etc. Describe your education and career until the present in the "Summary" field. Focus on qualifications, ambition and motivation. State at least 5 relevant competences in the field "Skills & Expertise". Your profile will appear as 100% complete, which enhances your exposure. Choose a picture that looks professional. The background must be neutral, i.e. no closets, paintings, etc. in the background. Spice up your profile with key words as many places as possible. Place your key words and titles different places in your profile, e.g. in the headline, summary, expertise, skills, etc. You can create a profile in two languages, for instance Danish and English. You will obtain the highest exposure by creating your profile in many languages. LinkedIn makes it much easier to keep track of your network and to stay in touch. You can also see when your connections change jobs. Expand your network by inviting your current and former colleagues, fellow students, and people from other academic activities. If you wish to get in touch with people from your industry, LinkedIn is a good opportunity to do so. There are numerous exciting and active academic groups on LinkedIn where you can contribute your knowledge, but also ask questions. A lot of the people on LinkedIn are part of the business community, so there are plenty of opportunities for you to expand your network and brand yourself within your field. Click “Add sections” under “Edit profile” and add different qualifications, publications, and files which underpin your language proficiencies, your CV, recommendations, etc. In addition to that, there are plenty of other things you can do. Are you on Twitter or do you have a blog? Create links under "Edit profile". It is important that you describe the links and refrain from the standard descriptions. You can also customise the URL to your LinkedIn profile. Usually this URL consists of an illogical sequence of numbers and letters. Delete the unnecessary and make your name appear from the URL. Recommendations help provide a nuanced picture of you. So ask your former bosses if they want to recommend you on LinkedIn. Current and former colleagues, clients, and suppliers are also relevant in terms of recommendations. The recommendations make your profile more credible.